There’s nothing flashy about George Coetzee’s grip. Or his game, for that matter. Check that: Coetzee led the European Tour in putting in 2014. That’s an eye-opening feat, indeed. We’ll take a look at the South African’s putting grip first. It’s pretty standard issue for a tour pro: reverse overlap, with the left index finger extended across the bottom three fingers of his right hand. 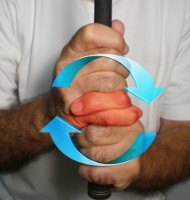 The left hand lies neutrally on the handle, with the right hand just a tad on the strong side. The only unusual aspect of Coetzee’s putting grip is the position of his left wrist. 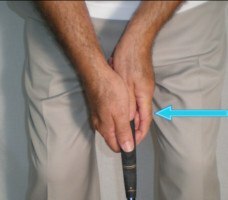 Where most pros feature a strong “uncocked” or “unhinged” posture here, Coetzee’s wrist is essentially flat (i.e., neither cocked nor uncocked). 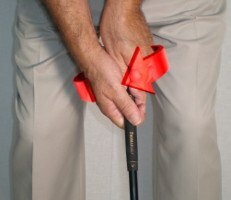 The lesson: There’s more than one correct way to hold the putter. On to the full swing. George Coetzee’s grip with the driver, woods and irons is basic and well-balanced. The left hand has a pronounced angle at the wrist and a “V” (between thumb and forefinger) pointed right of his sternum. Coetzee’s right hand “V” neatly parallels this position, assuring that his arms work together throughout the swing. Coetzee enjoyed an excellent season in 2014, notching his first European Tour victory. For better or worse, putting accounted for much of his success. Coetzee’s driving distance and accuracy, as well as his greens in regulation figures, were quite pedestrian. It goes to show how important putting can be, even at golf’s highest level. Check that: especially at golf’s highest level.